At the same time that Lloyd Kiva New's fashion and accessories boutique was flourishing in downtown Scottsdale, the White Hogan was also gaining a reputation for innovative and superbly mastered jewelry designs, flatware, and hollow-ware. The White Hogan Shop has its beginnings in Northern Arizona in the 1930s, and it officially opened its doors in Scottsdale in 1950. 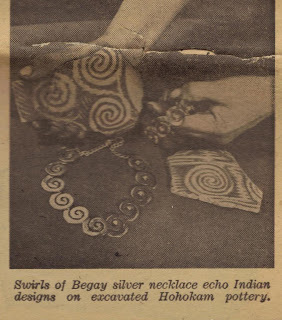 The shop enjoyed 56 years in business, effectively breaking the mold of Navajo jewelry and presenting a new 'modern' Native American silver chic. The shop closed in August 2006 after offering the work of three generations of Native silversmiths (it now exists as the vintage boutique space of Robert Black Fashion). 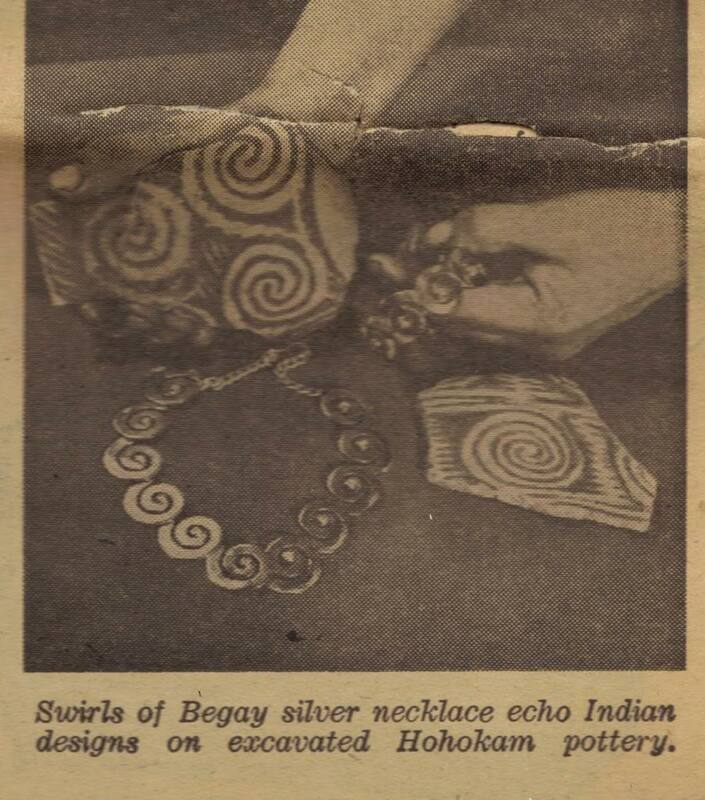 In the early years, the White Hogan employed brothers George Kee, Ivan Kee and Allen Kee, along with their first cousin Kenneth Begay, who is now known as 'The Father of Modern Navajo Jewelry.' 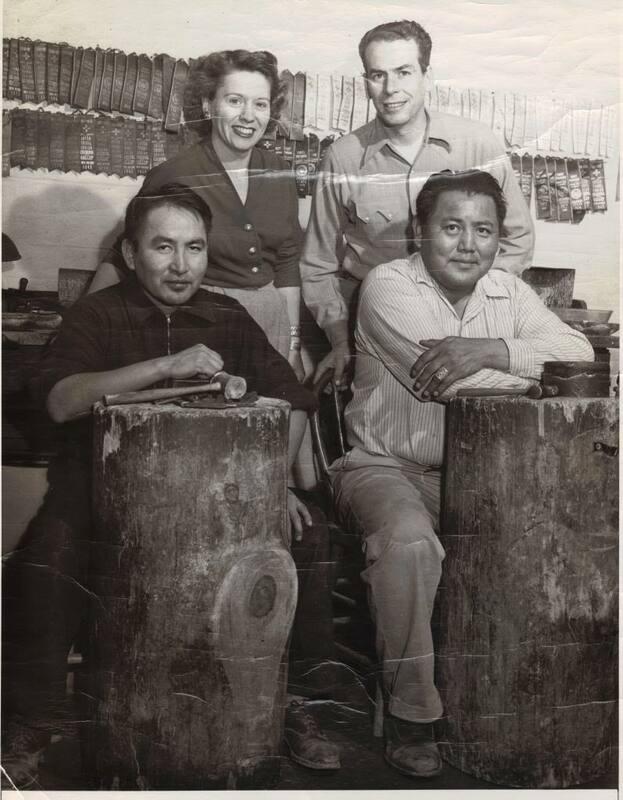 Many individuals who have been associated with this collective over the decades are not only world famous artists but have had a lasting documented impact on the world of modern Navajo, Native American, and American jewelry design. Pictured to the right are the original owners and craftsmen: Virginia Bonnell and John Bonnell (non-Native), and Allen Kee and Kenneth Begay. 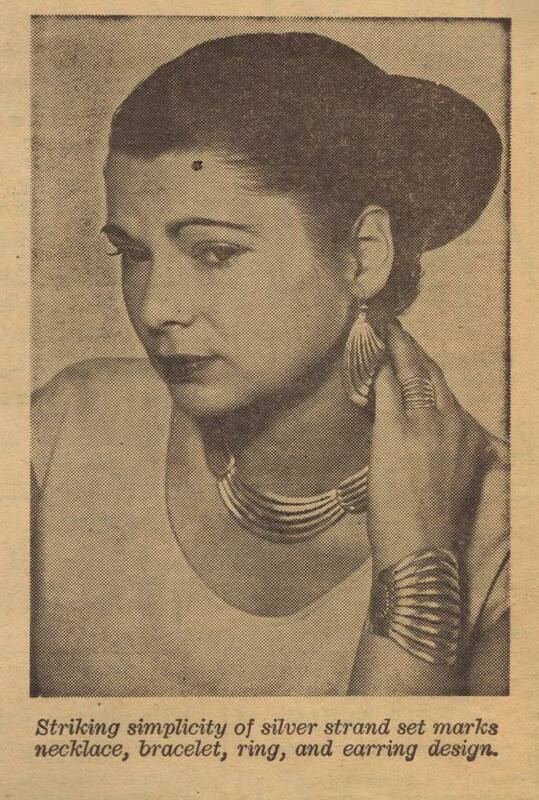 Their creativity, artistic vision, talent, and perseverance enabled them to establish an important legacy in jewelry design. The ultra-modern designs produced by this collective were featured in numerous newspaper and magazine articles. Below are snippets from an article in a section of the Arizona Republic called the "Arizona Days and Ways." This article was published in 1953. 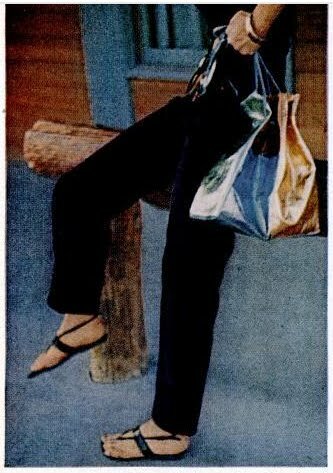 In 1956, Lloyd Kiva New and the artists of the White Hogan Shop were featured in a LIFE Magazine article titled, Sands of Desert Turn Gold: Southwest's Boom Enriches Scottsdale. 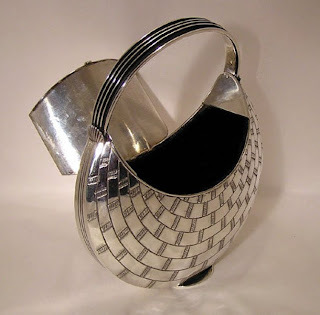 As the article notes, "There are craftsmen who work in silver and in leather. Dress designers, who charge as much as $1,200 for an outfit, have provided the country with new fashions based on native costumes and materials." These designers included the artists of the White Hogan (their jewelry is pictured below left) and Lloyd Kiva New (whose purse made from colored bands of leather with a metallic finish is displayed below right). 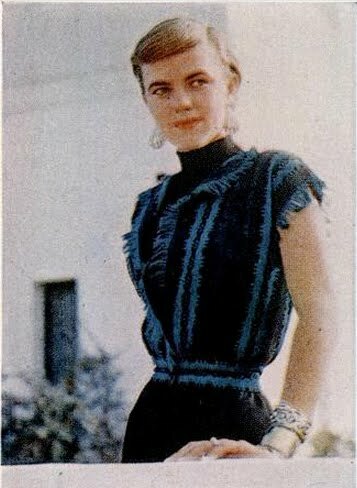 Both images below come from that 1950s LIFE article. Interestingly, when New and the White Hogan were flourishing, no dancing was permitted inside town limits, "because of a lingering fear of unruly cowboys and Indians." Still, these artists fought stereotypes and misconceptions about their Native cultures, and produced exciting Native couture. An example of this amazing work is by Kenneth Begay. His one-of-a-kind silver evening bag (ca. 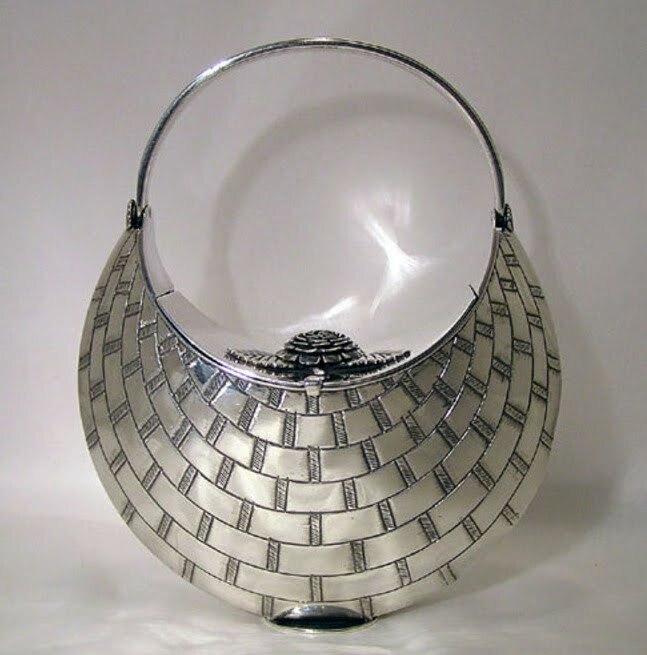 1960s) is fabricated from sheet silver, and the body of the purse has a basket weave motif that is stamped, cold chiseled and engraved to simulate a wicker basket. The hinged handle is decorated with parallel bars that are characteristic of his work, and this motif is still used today by contemporary Navajo silversmiths. The lid has a clasp and the interior is lined with black velvet. Discover more about the White Hogan Shop by clicking here or here. You could have at least given the AnthonyKeeJewelryCollection.com some credit for your info, some of this info is from our family archive, so I know you did have first hand knowledge of this info. Thank you, http://www.theanthonykeejewelrycollection.com/ is referenced at the end, but I have made alterations to make it more clear. I recognize that top photo as one I posted online a couple of years ago. That's my cufflink, my finger, and my desk pad! Cool! It's a beautiful shot of the White Hogan hallmark! I am in love with all things relating to the white Hogan. I love how they didn't just do one thing. They kept it all open to do what they felt was their calling. Influencing fashion design, jewelry and pop culture as a whole. Even today we see a lot of things influenced by Navajo symbolism and designs built on Navajo design as the foundation. I am not Native, but my ancestors had very similar beliefs and way of life. I believe we are one, as history conceals itself, so your symbolism I see as my own. Peace and love.